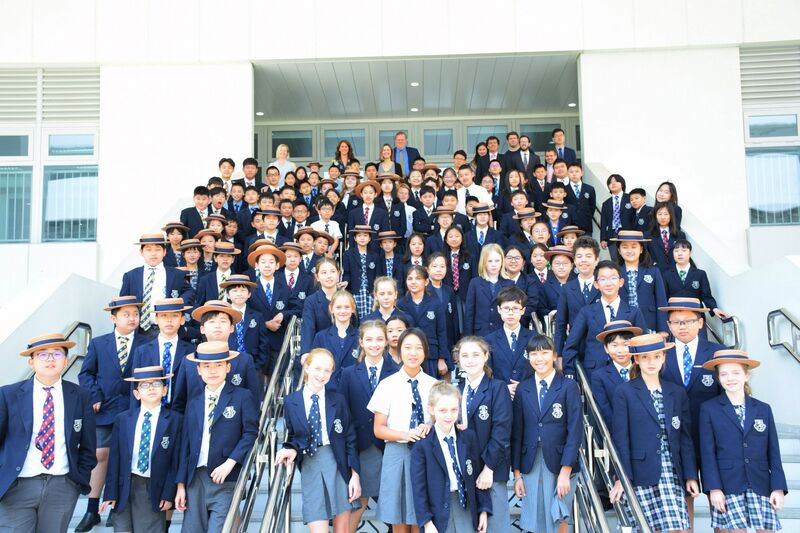 It is always a wonderful occasion when we gather together Harrovians from our sister schools in Asia to celebrate the academic prowess and leadership qualities of our pupils. 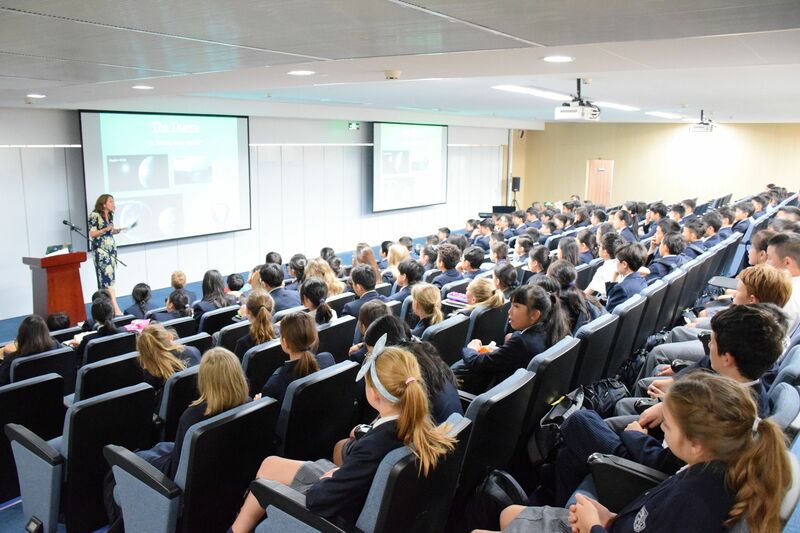 The 2018 Harrow Prep School’s Conference was no exception. 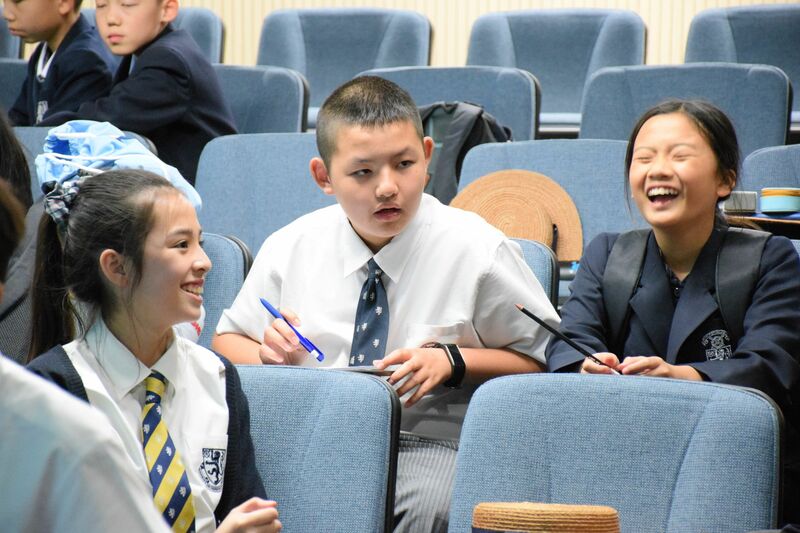 130 Harrovians from Harrow Shanghai, Beijing and Hong Kong came to Harrow Shanghai for a conference like no other. 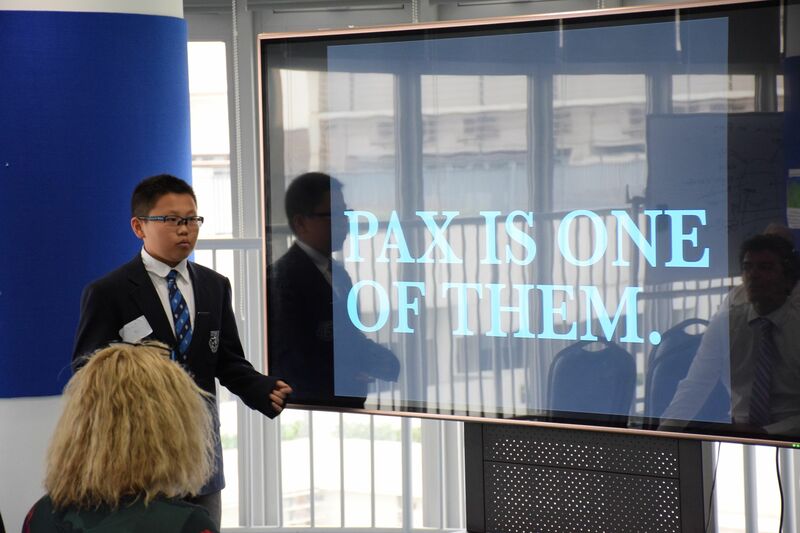 Open to all pupils in each of our Harrow Prep Schools, the conference demanded its delegates to speak confidently, persuasively and intelligently on this year’s theme, A Whole New World. Pupils were asked to reflect on the issues our planet is facing. How can we learn from these to ensure we do not make the same mistakes in the future? The scenario was simple; a new planet has been discovered, Pax, and pupil groups had to persuade our judges that how they proposed to use it was the best. From using Pax as a completely fresh start for the healthy and the law-abiding, to banning Donald Trump as President, ideas were diverse and at times, hugely entertaining. 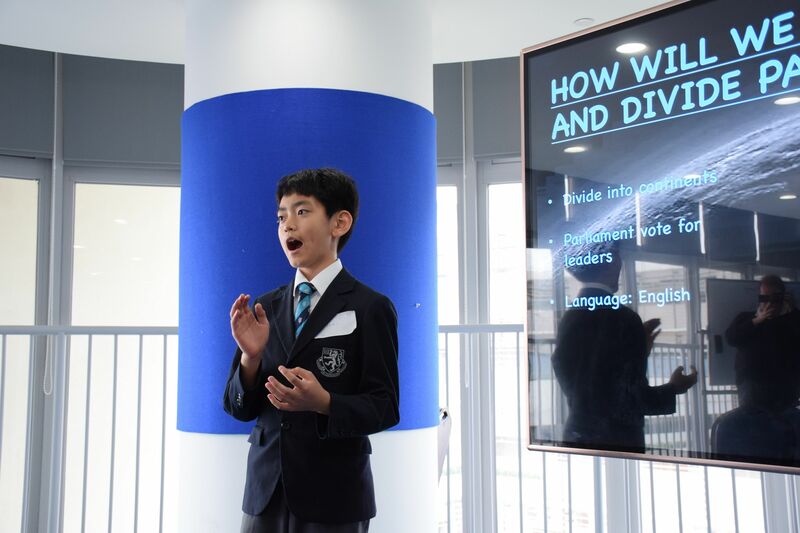 Pupils worked in their mixed school groups, making new friends with their peers and seamlessly creating very slick presentations, information leaflets and impressive adverts. Friday night gave our delegates time to relax and bond further with our pizza-pool party. A “Great Wall of Pizza” was created from the numerous 20” pizza boxes, their contents devoured by our hungry world leaders of tomorrow! As soon as all of the presentations were done, the delegates excitedly clambered aboard their buses to Lujiazui where a rooftop supper awaited us. Sadly, the weather dictated that our dinner was to be eaten inside, but thanks to the very cool Conference goodie bags, each delegate had a Harrow boater and selfie stick to pose up a storm on the 5F roof at the IFC. And pose they did! Sunday had an air of excitement about it (despite delegates and staff being exhausted and frustrated that again, their alarms had interrupted their weekend sleep!) 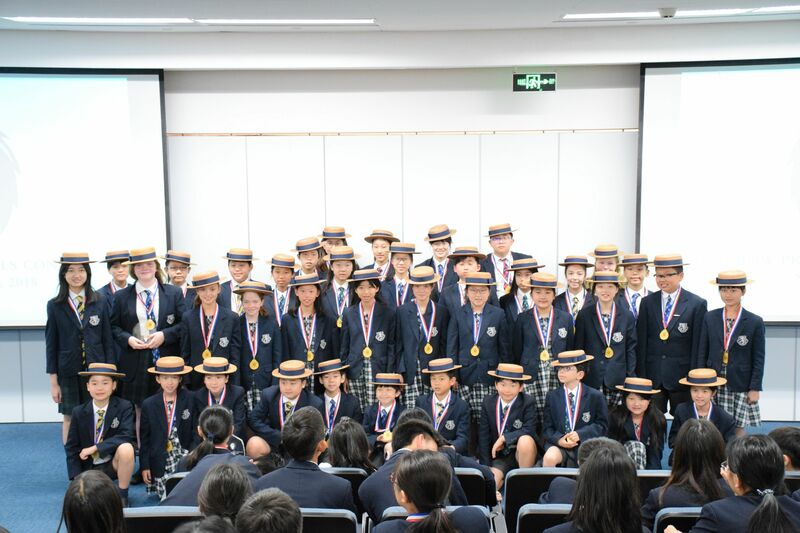 Pupils gathered in the Lecture Theatre and admired the glistening trophies, hoping that the 58cm high golden trophy for the winning school would be going home with them! 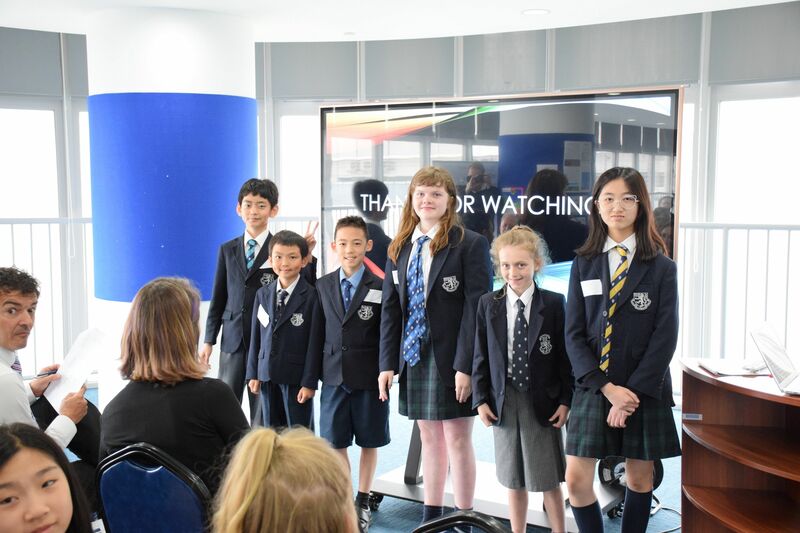 Judges had watched each delegate present and had made decisions on who they thought to be the “Most Improved”, “Best Presenter”, “Excellent Leader”, and all delegates voted for their “People’s Choice”. 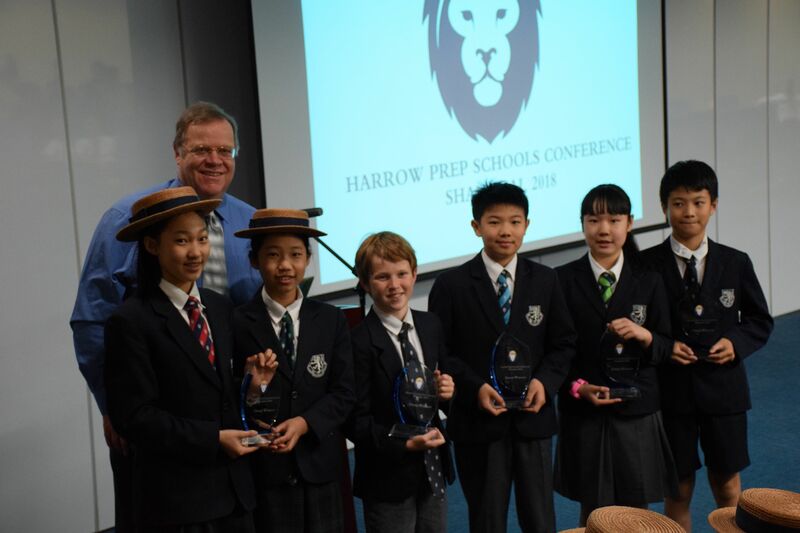 Impressively, two of the four prizes went to Shanghai Harrovians. 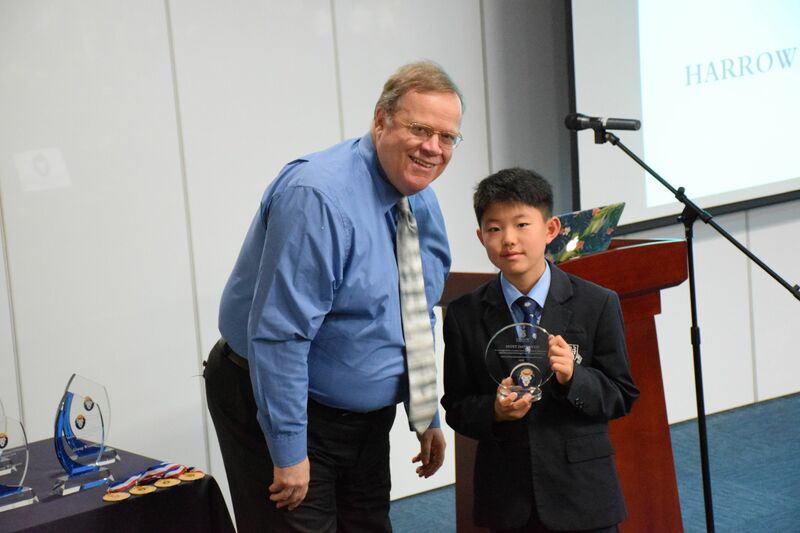 The judges voted unanimously for Lachlan Yu as “Excellent Leader” for his motivation of his teammates and his ease at establishing great relationships with his Beijing and Hong Kong peers. 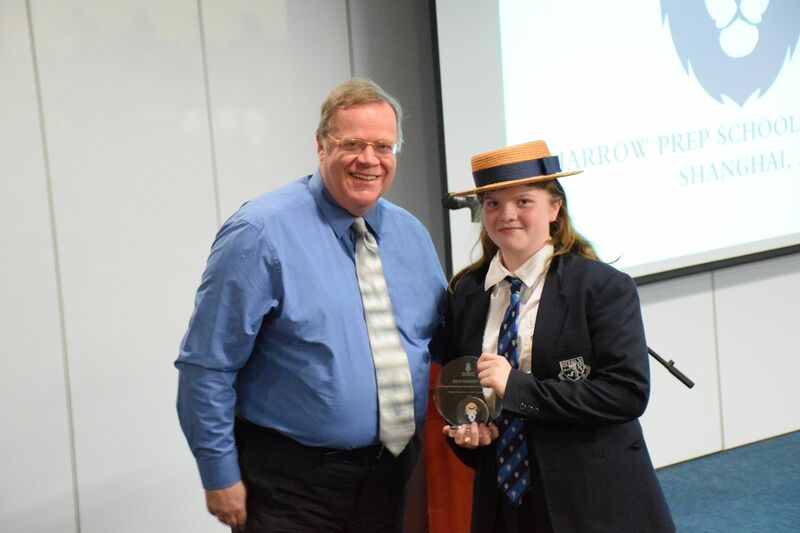 Emma Cook was also unanimously voted for as “Best Presenter” for her confident and animated presentation within her Division B group. Yannis Sittas was voted for by all of his fellow groups in Division A as the “People’s Choice”, with Shanghai’s Emily Kang coming a close second. 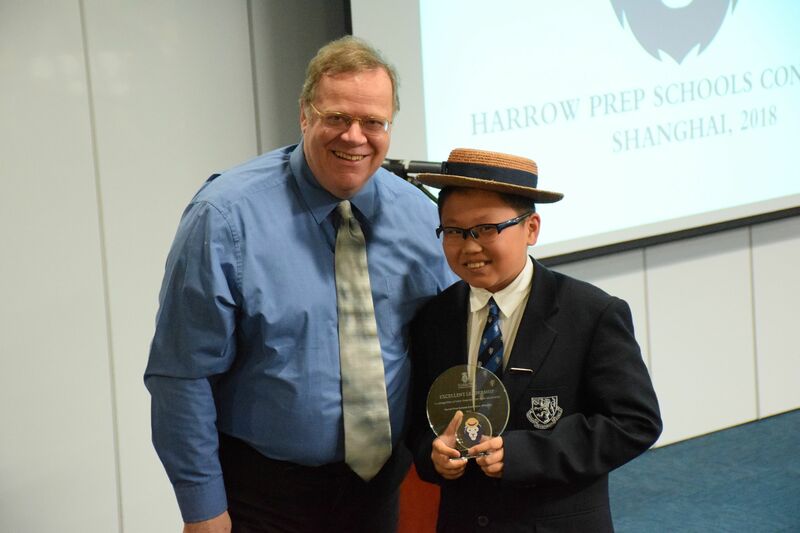 Shawn Hong from Harrow Beijing was “Most Improved” for showing such development across the two and a half days with his great courage of speaking in front of a large crowd so confidently. And then the glass “Group Winners” trophies were presented. Each group received a mark from each of the three judges for their presentation, leaflet and advert, and for how they answered the audience and judges’ questions. These marks were averaged out and were awarded to each delegate in addition to their individual mark awarded for their presentation and public speaking skills. The “Group Winners” were the group with the highest average score per delegate. In Division A the winning group had an average score per pupil of 7.3 but in Division B the top group was Group 6 with an average of 7.8. 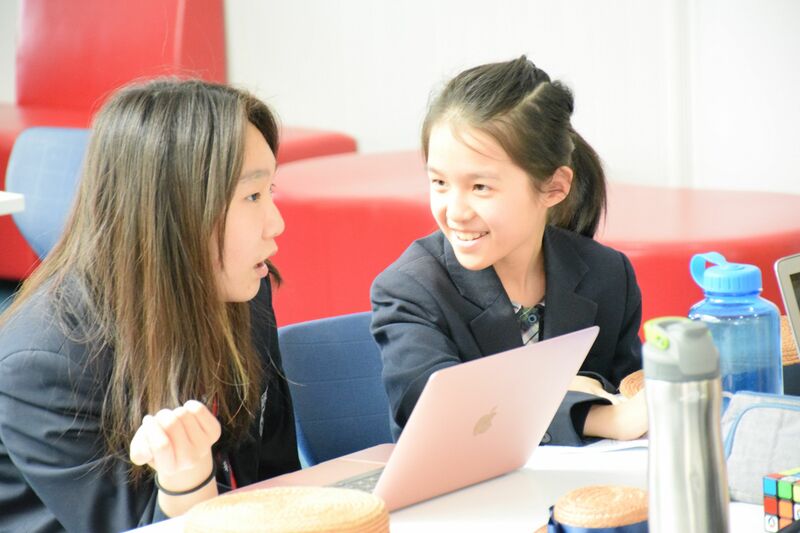 The members of this group were, from Beijing, Apple Han and Nemo Yi, from Hong Kong Charles Johnson and Alex Wong and from Harrow Shanghai, Elina Yang and Lynn Li. The Conference winners were then announced. Between first and second place there was only a difference of 0.08 per delegate. 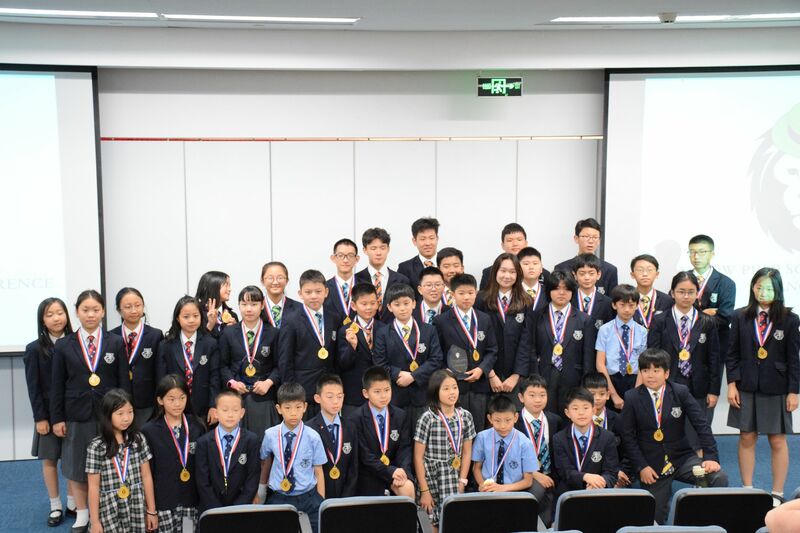 Beijing came third with an average score per pupil of 6.2, Shanghai came in second with 6.72 and Hong Kong were crowned the winners with an average score of 6.8. The Conference was rounded off in the only way possible with all three schools singing Forty Years On, the Harrow School song. 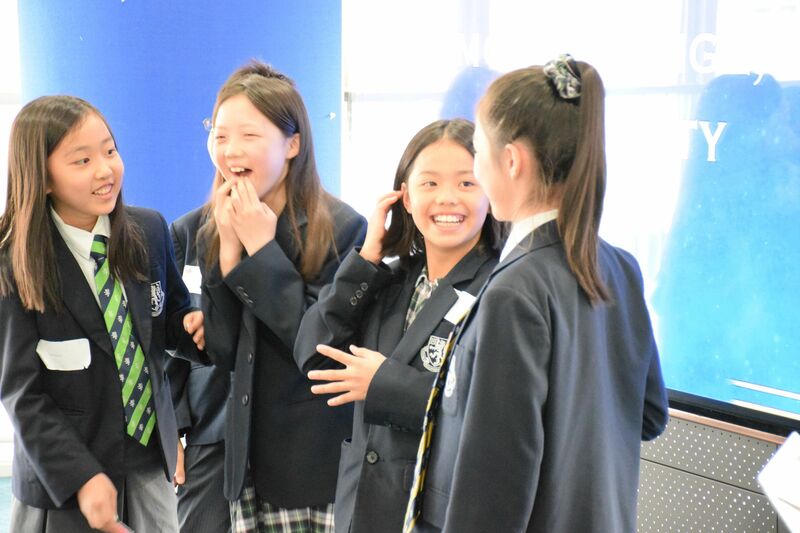 (Well, actually Harrow Shanghai sung note-perfectly whilst their Beijing and Hong Kong peers looked on in admiration tinged with confusion!) 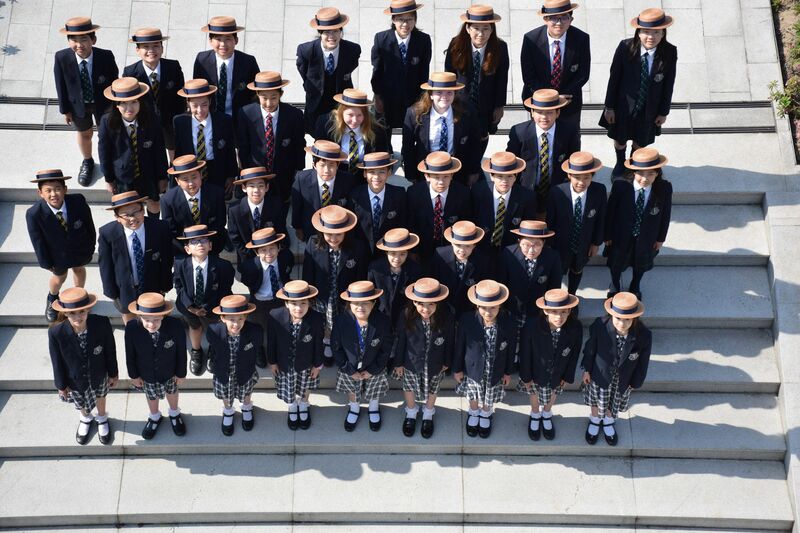 Let’s hope the Harrow Song Book finds its way to our sister schools before next year’s Conference, which will be hosted by the winners, Harrow Hong Kong.